I love food. I do not know about any of you but I like all kinds of different foods. I also like to try new things that I have never tried before. Just not some of the things that I have seen people eating on television and things that I have heard of. There are so many different delicacies that I am sorry to say but I really can not believe people would even attempt to eat some of this foods. Okay imagine this. You are in a foreign country and some one was to ask you what is your favorite foods? You respond with pizza, hot dogs, hamburgers, french fries or what ever else your favorite food may be. What do you think that their reaction will be? Well probably the same as your would be when they respond with either some name of food you have never even heard of before or something like guano (bat droppings) or monkey brains. Different countries are use to different things. My parents have always told me do not knock something until you have tried it, well in this case sometimes I think I will knock it before I ever even remotely think about trying it. Here is a list of some different delicacies around the world. Criadillas are a delicacy from Spain. They are deep fried bull testicles. Scorpions are a delicacy from China. These are scorpions that have been placed in boiling oil then placed on a stick. 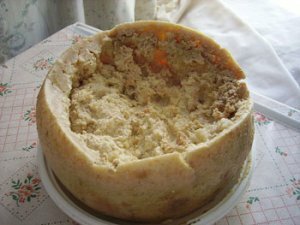 Casu Marzu is a delicacy from Italy. They take a bunch of the finest pecarino cheese and wait till it is almost all decomposed. Then fill it with insect larvae. This will break down the fat in the cheese. 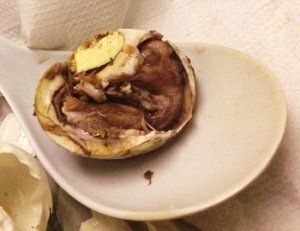 Balut is a delicacy from the Philippines. This is an egg that has been fertilized. It has an embryo that has been developed a little bit. It is boiled and sucked out of the shell. 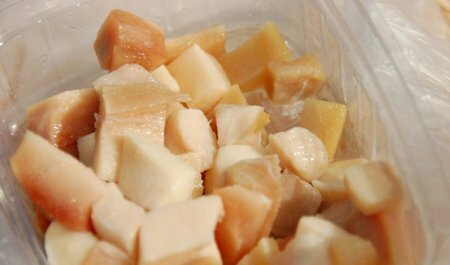 Hakarl is a delicacy from Iceland. This is shark meat that has been cured with a fermentation process. Then it is hung up for 4 to 5 months before it is served. Fried tarantulas are a delicacy in Cambodia. They take tarantulas and fry them up before they are served. Kopi Luwak is a delicacy from Indonesia. It is a coffee that is made from the droppings of a cat called the Luwak. Ortolan is a delicacy from France. This is a song bird. People eat the bones, beak and all. They place the live bird in a glass of Armagnac (which is a type of brandy). Sannakji is a delicacy in Korea. They take live octopus and cut them into small pieces and coat them in sesame oil than serve immediately. 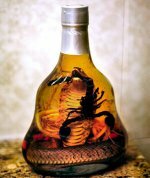 Snake wine is a delicacy in Vietnam. They take a rice wine and place a very venomous snake inside. Then let the snake stay in it for a few months so the poison will dissolve into the wine. They say this is also used for medical purposes. I am sure if you do not prepare any of these meals the right way there could be potential harm to you. But if you go to a place that serves these different and unusual foods they are trained well enough to cook and prepare these items so that you do not get hurt or even worse die from eating any of these foods. There are other delicacies that you should definitely think twice before you try them. One being a puffer fish. It is very poisonous fish and does not have a cure yet. If it is prepared wrong they have a deadly poison in them and if consumed you will choke. The puffer fish will cause your throat to swell shut. Making it impossible to breath and then you die. So if you are thinking about going out on a limb and trying something new and unique do your research on the food you will be eating first to find out pros and cons of it. 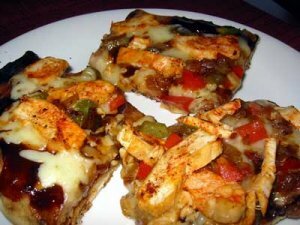 Share a link to a page on Unusual Delicacies Around The World and we will consider it for placement on this page.